If you're into kayaking, chances are you dream about living in a beach house, dragging your kayak through the fine sand to the water with ease. It will then be just a matter of minutes until you can start paddling away into the beautiful paradise. Now, let's wake up and face reality, most of us are not lucky enough to own such a place. In fact, you probably have to drive miles in order to enjoy this experience. 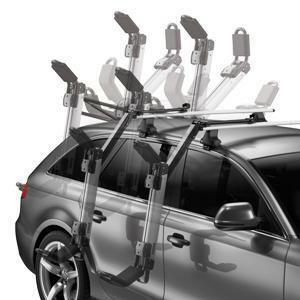 Therefore, finding the best kayak roof rack is a must. Why You Should Buy a Kayak Roof Rack? 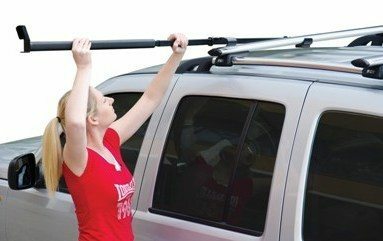 What to Look for in a Kayak Roof Rack? This whole venture can be tricky. You must make sure it fits your car, but you also want safety and a secure transportation. There are plenty of choices out there, which makes this whole endeavour even more challenging. Most specialists recommend going with the top rated racks out there. 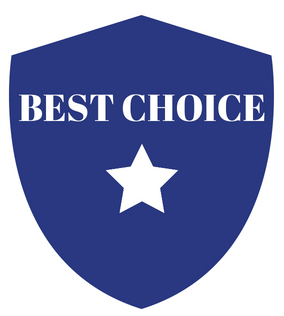 We have done our own research and below are our top picks. Fits up to 36 inches wide kayak. Pricey but you pay for what you get. Easy to load & unload. Extra large padding for protection. Mounting the rack on oval aero style bars can be challenging. Thule is a front runner in terms of kayaking accessories. You don't have to learn how to build a kayak rack when you have the perfect item right in front of you. This model is made of aluminum. It has a double coated steel design, so it can easily resist corrosion. Even if you don't live on the beach, chances are you live somewhere nearby, so humidity is high and corrosion is always an issue – not anymore. This product will support your kayaking adventure for ages. 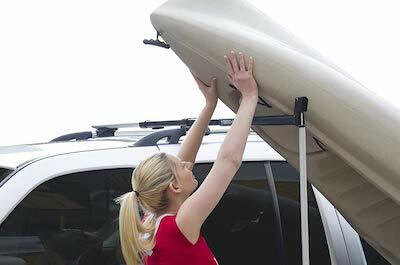 The kayak stacker from Thule is adjustable, so it makes no difference how narrow or wide your kayak is. Its cradles can expand and support even the widest models on the market. Both your car and the kayak will be in good condition because this model comes with eight touch points. They are all padded, so the kayak never really touches the surface of your car. None of these expensive parts will scratch or bend. Other than that, using the rack is piece of cake. You can do it yourself. It comes with gas assisted struts. They lift and lower based on how strong you are. Overall, they can take up to 40 pounds of the kayak weight. Furthermore, you can take advantage of double extending arms too. Their main role is to lower the kayak by 40 inches. You can strap it at waist height, so loading and unloading should never pose any problems. The maximum load it can take is 75 pounds. Luckily, most kayaks can easily go within this range, yet there are some exceptions too. Double check your kayak before buying a roof rack though. Some users complains on difficult installation. If overall maintenance is what you're looking for, then the Yakima will be the ideal choice. It requires close to no maintenance at all. However, maintenance pales when you check out its versatility. Unlike other racks in this segment, Yakima's model allows carrying multiple kayaks as well. It has a plethora of settings for adjustability. For example, you can take one kayak in the classic J craddle position. You can also transport two boats at the same time in a vertical position. Worried about storing it away? It folds down, so storing it is piece of cake – the boot of your car or just somewhere in the porch. In terms of performance, this rack can take pretty much any type of kayak. You might experience some issues if you want to transport two kayaks at the same time though. It's challenging to set them both up, but it's not impossible. If your kayaks are really thick and wide, you might have a problem though. On a positive note, the rack comes with multiple contact points. They are extra padded, so the kayak will never scratch against your car – ideal for protecting both the car and the boat. The padded points also ensure stability as you travel due to restricting movements when you accelerate or brake. Plus, it locks to base rack. If you're still anxious about it, you can get a SKS Lock Core for extra safety, yet it's not included in the package. It must be purchased separately. Securing the kayak on your car won't pose any risks either. The package comes with heavy-duty straps, as well as tie-downs. Make sure the boat is set in place and always double check before you hit the road. 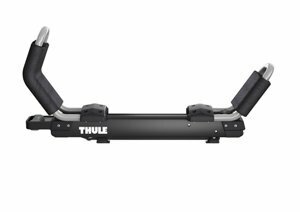 Allowing you to carry one kayak in a horizontal position, the 887XT model from Thule is probably the most suitable kayak rack for SUV. Furthermore, if it can go on an SUV, it can easily match any small car as well. The fit is literally perfect. Saddles pivot, so they will conform pretty much any shape and size. No matter what type of kayak you have, chances are you'll fit it on your car with no problems at all. Given the horizontal position, you cannot add more racks for other kayaks due to the lack of space. 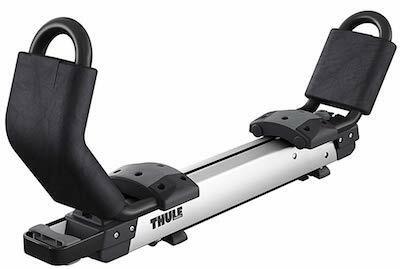 Thule is famous for making loading and unloading a breeze. Most other racks don't support this operation, which can be quite heavy. Not only you risk scratching both the kayak and the car, but you also have to be pretty strong to do it yourself. It's usually a two person operation – not with Thule though! The roller slides and extends beyond the back of your car. In other words, you can load the boat by yourself. It can take up to 40 pounds in weight, while the maximum width is 36 inches. Simply put, this system takes over 50% of the weight of your boat. The package is complete and includes the straps as well. It has four touch points. Obviously, they are padded for extra protection. 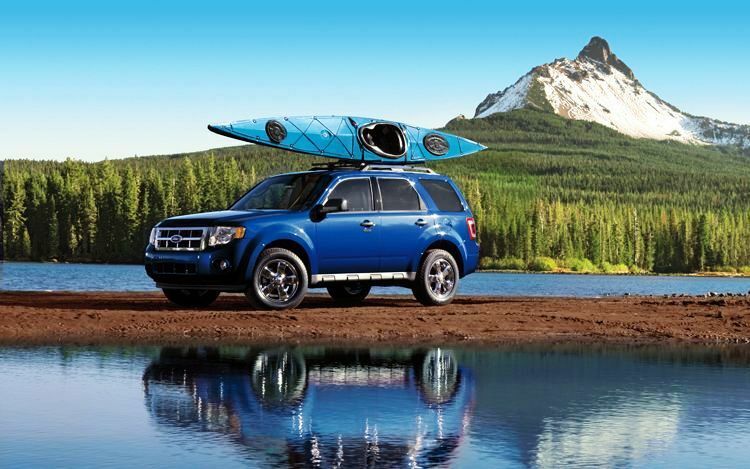 It makes no difference how bumpy the terrain is – you can transport the kayak with no risks at all. In terms of durability, you can count on double coated steel. It's corrosion-resistant – ideal for those who live close to waters. Humidity will never affect its construction. Rhino Rack doesn't build kayak roof racks with bells and whistles. Instead, the manufacturer sticks to the basics and pushes them to a superior quality. Nothing is fancy enough to make the price too high, hence the good value for money. After all, you only need some transportation for your kayak to the nearest water. 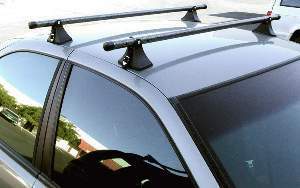 This rack comes with extra protection on the roof of your car. It has thick padding on the clamp undersides, so there are no risks to scratch the car. 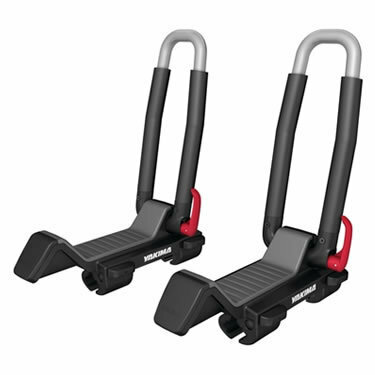 Furthermore, the clamps are suitable to most roof racks. Unless you have a supercar, chances are the rack will perfectly match your roof due to its deep adjustability. 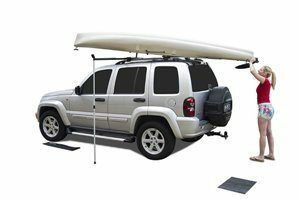 If loading or unloading the kayak is usually a two person operation, Rhino Rack's best kayak roof rack changes this misconception. You can now do it by yourself. It makes no difference if you're not strong enough or just too short. The loading goes on the side. You just need to be careful when you drive, as your vehicle will obviously become a bit wider. 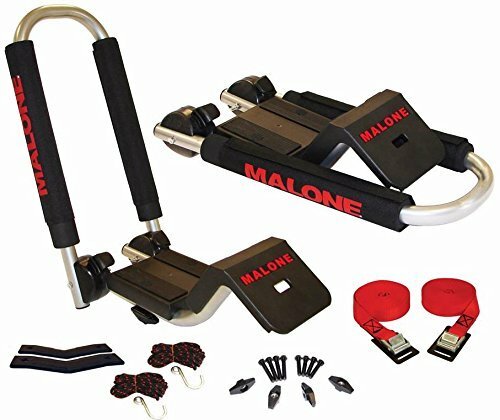 Unloading is just as easy – there is a quick release strap that doesn't require pulling straps and handles. Worried that your kayak is too heavy? Forget about it. You have a support pole for kayaks heavier than 44 pounds too. It adds more stability and security, yet you should still be careful when you drive. In terms of safety, you can also count on an integrated load stop. Its primary purpose is to prevent the kayak from sliding off the bar. Although some people choose to leave the rack on even if they don't go kayaking, you can take it off and store it appropriately in the heavy duty storage bag that comes with the package. Built to make loading and unloading easy, this easy load kayak roof rack from Malone provides an excellent value for money. 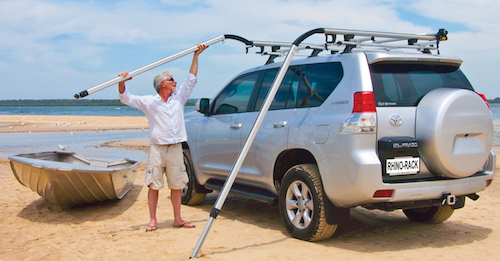 It's a J style kayak roof rack designed to fit most types of roofs. Moreover, loading has never been easier due to the boarding ramp. It's built in, so you don't have to install it yourself. It's designed to be safe and secure, but also to ensure that your kayak or car won't get scratched. Simply put, loading is no longer a two person operation, whether you are short or just not strong enough. If you still find loading a hard job, you should know the rack is compatible with the MPG351 Telos Load Assist technology. However, you would have to buy the system separately. Unlike other similar models in this segment, the rack comes with extra large padding. No matter how bumpy the road is, chances are your kayak will reach the destination in perfect condition. It makes no difference what shape or size it is. In terms of sizing, the rack can take any kayak up to 75 pounds in weight. It's only suitable for single kayak transportation though. The rack comes with JAWZ mounting hardware. It's compatible with almost any type of cross rails, including square, round and oval rails. Besides, it has two types of bolts – 60mm and 70mm. The roof rack is designed to be space efficient too. It has a folding construction When not in use, it folds down, so it provides more overhead space. 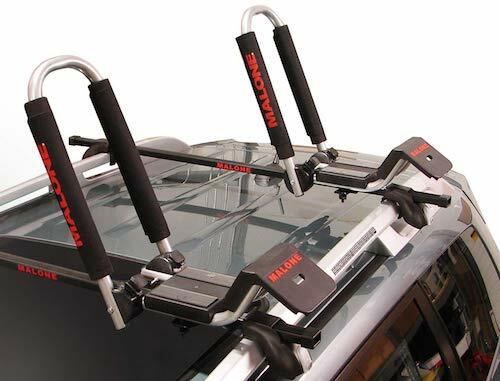 There are multiple reasons wherefore finding the best kayak roof rack on the market is such a good idea. Most importantly, it's a cost efficient solution. Unless you have an inflatable kayak that can fit in a bag inside your boot, chances are you'll seriously have to think about transportation. Unfortunately, your options are limited. Apart from roof racks, your only option implies buying or renting a trailer. Not only a trailer doesn't work with any type of car, but it's also expensive. It comes with a series of legal requirements as well. 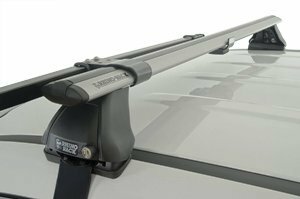 Second, kayak roof racks are specifically built with extra features to ensure your boat stays in good condition. This isn't a bag or luggage for when you go on holiday. Instead, it's a large sports equipment. It's heavy and can easily get damaged if transported irresponsibly. While a trailer might work, it doesn't provide as much protection as a roof rack. Most racks come with padding. Therefore, the kayak is less likely to get scratched. Even if you drive on bumpy roads, it will be secured in place and won't slide. Apart from protecting your kayak, such padding is ideal for your car as well. Given the weight of a kayak, sliding over your car will leave a nasty visible mark. Third, don't overlook the space efficiency either. Sure, kayak roof racks are specifically built for such boats. But then, they're quite versatile. Plenty of people don't even take them off their cars because they can use them for other things, such as luggage. Of course, it depends on the shape and style, but generally speaking, they come with multiple uses. It's like having a second car boot on top of it. 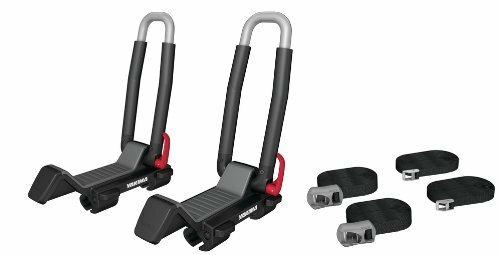 As if all these were not enough, some roof racks come with loading and unloading assistance. If you have always had to seek help for this operation, you can now do it yourself. It makes no difference if you have no strength or you're really short – such features will make your life easier. But then, you should know that not all roof racks come with loading and unloading assistance. 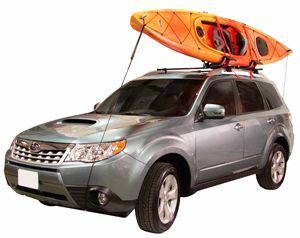 When trying to buy a kayak roof rack, most considerations float around the main elements in this whole game – the boat and the car. Some cars come with a bare roof. In other words, there are no extra structures on top. Some others come with rails. Go check your vehicle – forget about this type of transportation if you have no rails. Some people might suggest foam padding – terrible idea. It looks fine at first, but it's not as secure and safe as an actual rail. Therefore, there's a decent risk to lose the kayak or damage both the boat and your car. Luckily, you can buy rails and crossbars yourself, even if the car is not fitted with such a system. This way, you'll be able to attach most types of kayaks. How about your kayak? What type is it? Although they share some common specifications, different types of kayaks are built with different specifications in mind. Some of them are narrow, while others are extra wide. No matter what type you got, make sure the rack you purchase can accommodate its size. Some manufacturers focus on specific kayaks only. Buying an adjustable rack is better though. You might change the kayak overtime or perhaps you'd like to try a different type. How often do you go kayaking then? If you like to do it every weekend or even more times during a week, you'll probably hate putting too much effort into loading and unloading the boat. Therefore, opt for a carrier that provides assistance with such operations. Ideally, you should be able to load and unload the unit yourself. From this point of view, you can also choose between side and top loading kayaks. They're both useful, yet the side alternative is easier to use. It does make your car wider though, so you'll have to pay more attention when driving. Finally, go through small features as well. Most manufacturers try to enhance their roof racks with all kinds of specs. Opt for safety and protection for both the kayak and the car. Also, look for adjustability, as well as a solid construction. You don't want to scratch the kayak or the roof of your car, just like you don't want it to fall over when you drive over a speed bump. Go for a reliable and well established manufacturer too. Sure, you can buy a kayak roof rack Walmart, but you should never count on superior quality or a good service if you need any help from the manufacturer. Well established companies are specialized in this field and put lots of effort into designing quality models. 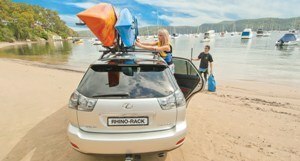 Bottom line, choosing the best kayak roof rack is not a general aspect that works for everyone. What works for some people may not work for you and vice versa. Just like for everything else out there, you'll have to make this decision with your personal needs in mind. 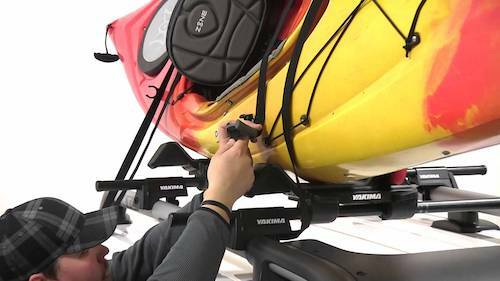 Think about your kayak, your car and the potential kayaks you might get in the future, then opt for an adjustable rack that can handle most types of boats. 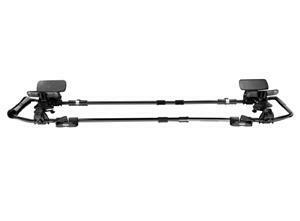 For us, the roof rack that fits us the best is the Thule Hullavator Pro Kayak Carrier. It is probably the most complete roof rack on the market at the moment. We rate it 5 out of 5 stars as we could not find anything to complain on. It comes from a top rated manufacturer and can be adjustable to pretty much any kayak size. Moreover, it makes loading a matter of seconds and can take heavy boats as well.